by Loren Yellow Bird, Sr.
UPDATE: The February 7 presentation has been cancelled due to weather conditions. The original article appears below. The Sand Creek Massacre National Historic Site (NHS) will host a free presentation by Loren Yellow Bird, Sr., at the Crow Luther Cultural Events Center in Eads February 7 at 6:00 p.m.
Mr. Yellow Bird's presentation, "A Warriors Tale: Repairing and Reviving the Language and Identity of the Arikara Tribe on the Northern Plains,"will explain how the pressure of assimilation nearly destroyed the Arikara language and cultural identity, and how the modern Arikara people have revitalized and are preserving their culture for generations to come. Loren Yellow Bird, SR. - NPS Park Ranger Loren Yellow Bird at Fort Union Trading Post NHS, North Dakota. Mr. Yellow Bird is a member of the Sahnish Arikara Nation from North Dakota. He is a noted Arikara traditionalist, historian, and received his bachelor's degree in History and Anthropology from North Dakota State University. He was also a recipient of the North Dakota Apprenticeship Grant to learn and study traditional stories and songs with Sahnish elders. 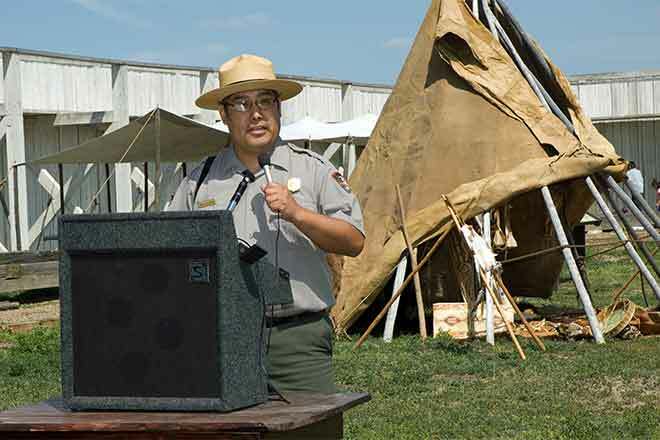 A Veteran of the United States Navy, he is currently a National Park Service Park Ranger serving at Fort Union Trading Post National Historic Site in North Dakota. Mr. Yellow Bird's presentation is part of an education series, hosted by Sand Creek Massacre NHS, on Native and Non-Native American perspectives of history. This series of speakers/educators will be scheduled throughout 2019 to present sessions that will address American history, tribal histories, and American Indian Law. Additional information is available from Karen Wilde at 719-438-5916 or at www.nps.gov/sand.